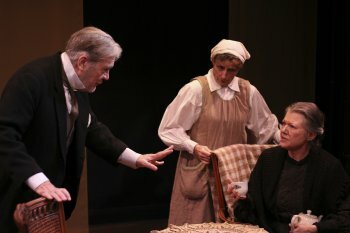 Beautiful production of a lovely play about a family of a poet like Emily Dickinson by the legendary Susan Glaspell directed superbly by Alex Roe. Although almost forgotten today, Susan Glaspell was the major woman playwright in America in the first three decades of the 20th century before the advent of Lillian Hellman. A co-founder of the influential Provincetown Playhouses both on Cape Cod and in Greenwich Village with her husband George Cram Cook, she helped to launch the playwriting careers of Eugene O’Neill and Edna St. Vincent Millay. She also wrote Trifles, which may just be the most anthologized American one act play, and “A Jury of Her Peers,” the short story she derived from it. However, she also won the 1931 Pulitzer Prize for the lovely Alison’s House, the first original play by a woman to win this award, as well as making her the second female winner of the prize for drama. Metropolitan Playhouse is currently offering a beautiful production of the first uncut revival of the play. Not only has director Alex Roe given it a superb interpretation that highlights all of the play’s timely themes, but the excellent cast is giving indelible performances of the play’s vivid characters. Inspired by the life and legacy of famously reclusive poet Emily Dickinson, Glaspell was refused permission by the Dickinson family to use her name. As a result, the plot has been fictionalized using elements of the true story which actually gave the author a little more leeway to pursue her themes. Reset in the Stanhope homestead in Iowa (where Glaspell hailed from) on the Mississippi River, the play takes place on December 31, 1899 as the old century is coming to an end and a new one is about to be born. Elderly Agatha Stanhope has gone on living in the home she shared with her sister Alison Stanhope, the poet whose work was found and published by her family after her death 18 years ago. However, Agatha has grown too old to go on living alone in the house even with a servant to help her. As the family helps break up the house in order to turn it over to new owners, this is the last day that Agatha will be living in the only home she has ever known. While her brother, his secretary and her niece and nephews work to pack and sort through the detritus of decades, two visitors show up: Richard Knowles, a poet on the staff of the Chicago Record Tribune wanting a story about Alison, and Elsa Stanhope, the black sheep niece who some time before ran off with a married man. Neither of them is welcomed with open arms. The family has not been forthcoming all these years about the rumor of a romance which was broken off between Alison and a married man, and have never given interviews to the waiting and impatient world. However, young nephew Ted, a Harvard college student, takes pity on the reporter and goes upstairs to show him Alison’s closed room, never before shown to an outsider. Louise, the wife of nephew Eben, tries to forbid Elsa from joining the family on this last day, but her father John is glad to see her, while her Aunt Agatha refuses to recognize her, claiming she has gone away. And then a fire breaks out threatening whatever papers or treasures are left in Alison’s house. Who could be guilty of such an act of vandalism and what is still hidden in the house? Alison’s unpublished letters, more poems beyond those which have already been published? The play deals brilliantly with issues of privacy and legacy. What does a family of a celebrity owe to the world and what do they have a right to conceal? As the century is about to change, the values of the Victorian world appear to be dying: the strict code of sacrifice that we discover has overshadowed the lives of many of the Stanhopes may be passé, while the younger members demand to live out their passions and dreams. What legacy does such a family owe to the world due to the fame of one of their members? Can rediscovered papers of the famously reclusive Alison be consigned to the fire or do they owe it to the world to reveal family secrets kept hidden for decades due to propriety? These topics are still relevant in a world where the internet has destroyed all previously held notions of privacy. The play is unusual in that its three acts which all take place on one day are like individual one acts, with each one offering a new problem which is solved by the end of the act. However, the cumulative nature of the material makes this a very satisfying dramaturgical device. As the play is about an unseen poet, the verses quoted by the young reporter are particularly impressive in the style of Emily Dickinson. The play also has a vivid array of characters that are all drawn in three-dimensions. While the Stanhopes and their associates are all representative of specific beliefs and roles, the cast makes them sharply etched and in full focus. As the returning prodigal daughter Elsa (the role originally played by Eva Le Gallienne who also directed), Amanda Jones is sympathetic as a woman who has followed her heart at great expense to herself, her lover and her family. As her father with his old-fashioned 19th century beliefs that no longer seem to be working, John D. McNally is a man of integrity finding himself caught between two worlds. Sidney Fortner’s Aunt Agatha (seen briefly) beautifully delineates an elderly woman slipping into dementia and her memories of the past. As John’s secretary and the daughter of the woman he loved for many years but to whom he was not married, Meredith M. Sweeney is very endearing as a valued employee who has come to be seen as part of the family. Paul Herbig’s reporter Richard Knowles is extremely sympathetic as a man doing his job but who genuinely admires the subject of his research. His declamation of poetry is spot on. Blaine Smith is amusing as the young Ted whose college English grade depends on his uncovering some family secrets, while John Long as his older brother Eben is seen champing at the bit of family restraints under which he has lived all his life. Only Anne Bates as his narrow-minded and holier-than-thou wife Louise seems to be playing the stereotype rather than the spirit of the role. Matt McAllister and Katherine Scarborough are amusing as the vulgar couple who are planning to buy the house and turn it into a summer boarding house. As an old family retainer, Florence Marcisak is fine as an elderly servant caught between her mistress and the new ways of the world. The two sets designed by Roe are clever suggestions of a 19th century mansion as it is about to be dismantled. Fortner’s many period costumes for the cast of 11 take us back to a time when formality was just about to lose to something more comfortable. The lighting design by Samantha Davis and Patrick Mahaney are serviceable for the three time periods of the play. Long (who also plays Eben) is responsible for the time-appropriate fight direction needed by the storyline. 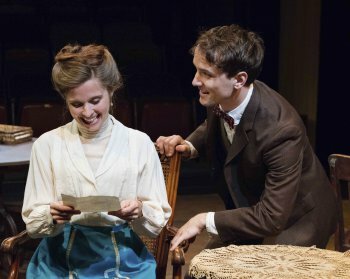 Metropolitan Playhouse has done itself proud with its revival of the rarely seen Alison’s House. 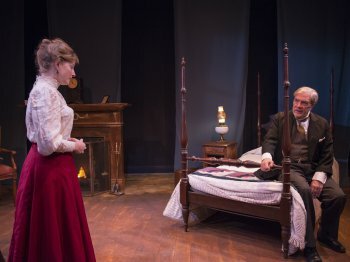 Alex Roe’s splendid production with its accomplished cast demonstrates the vitality of Susan Glaspell’s play as well as its contemporary relevance. This is a revival of the highest caliber. First-rate production of a popular 19th century melodrama on intolerance and Anti-Semitism seems to be preaching only to the converted. Exciting and powerful agitprop play from the Federal Theatre Project, circa 1936, will make you want to write to your congressperson – and picket! This is old-fashioned theater at its best, provocative, absorbing and unpredictable.